Prince William’s public kiss to his son, future King George, in front of the hospital where George’s sister was born was touching. The little king in training was beyond adorable as he waved to his future subjects in the UK. Proud pappa William rewarded his precious son with a loving kiss. Little George will be full of love when he grows up as he has been kissed and treated with open affection since his birth. 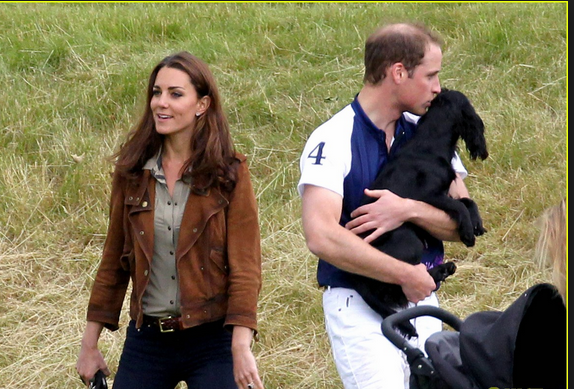 Prince William is a loving father who can freely display his affection to all of his children including his animal children. 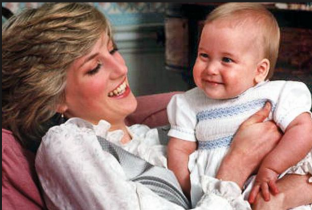 This is because as a baby he was given the same affection by his mother, the late Princess Diana. Her physical affection towards both of her sons was reciprocated as they feel so physically comfortable around her with William’s arms around her neck and Harry nuzzling into her in the photo on the right. 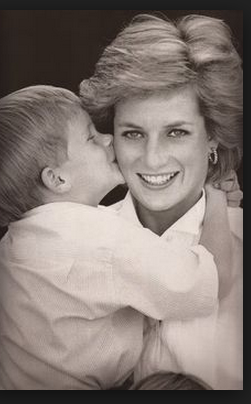 In the next photo we see as we see with Prince Harry kissing his mom. Until Diana entered the Royal family, one never saw public displays of kissing. 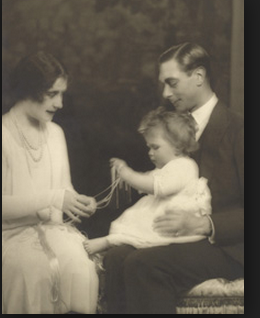 However one did see affection displayed towards past royals in a more formal way. Prince Charles also showed love towards William as he seemed to be in awe of his son. 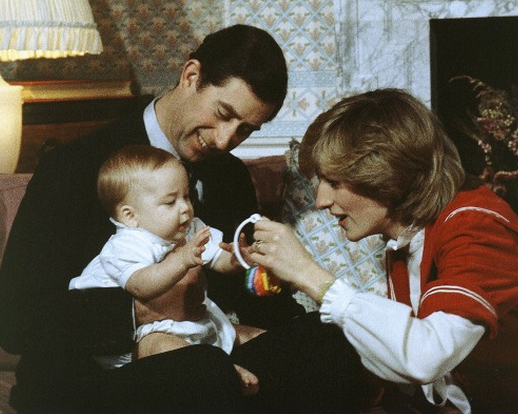 You can see his genuine smile as the baby sits comfortably in Charles lap. 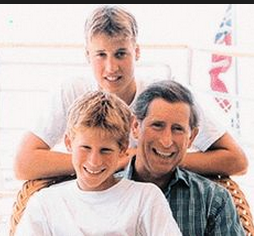 As the William and Harry grew older you could really see Charles’ genuine affection for the boys and vice versa as depicted in this photo below. Charles’ parents did not show him physical affection via kisses (at least publicly) as it wasn’t done then. It was not considered proper royal behavior to do so. 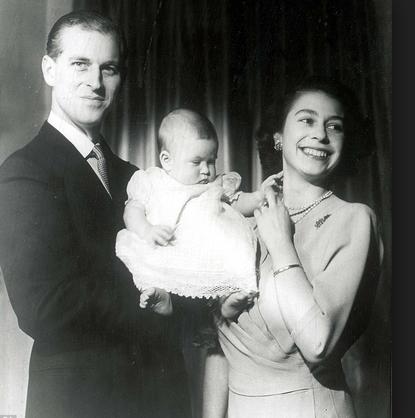 The only thing Queen Elizabeth did get away with at least publicly was allowing baby Charles to grab on to her finger. Among the Royals, things were more formal and one didn’t kiss in pubic. 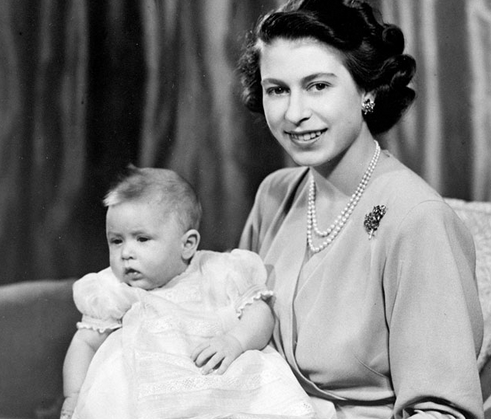 The Queen, however did show her affection by placing her hand on the back of Baby Charles and her cheek on his little head, but it was a posed shot as she looks away from the baby and not towards the baby. While the Queen was in a formal pose and not physically affectionate with Baby Charles, her genuine smile says it all that she adores him as her body gravitates and leans in towards him. It seems she is doing all she can to contain herself for the public photo. But she can’t resist and takes the baby closer to her as she smiles adoringly at Charles. As a baby Queen Elizabeth was also given a tremendous amount of love and affection by her own parents as you can see in the photos below. 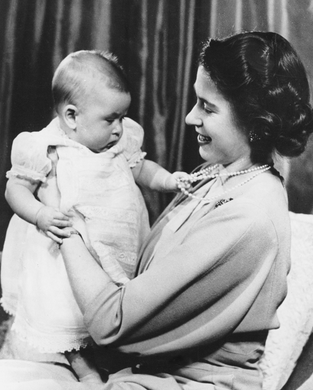 The Queen’s mother adored her as she leans into the little future Queen and delicately touches her little arm. 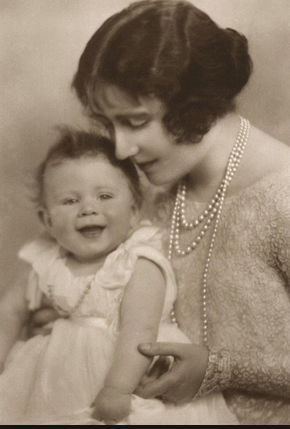 Elizabeth’s body sinks into her mother as she looks like one very happy smiling baby. Queen Elizabeth’s father King George adored his daughter as she sits on his lap and he holds her lovingly. The expression on his face is priceless as it reflects a proud father who would be comfortable holding her all day. This generational photo analysis indicates that the future King George and his little newborn Princess not only have legacy of coming from royal blood, but they share the legacy of coming from parents, grandparent’s, great-grandparents, and great great parents where there was considerable love being passed down from generation to generation.